The PM700 series meter offers outstanding quality, versatility, and functionality in a cost-effective, ultra-compact unit. 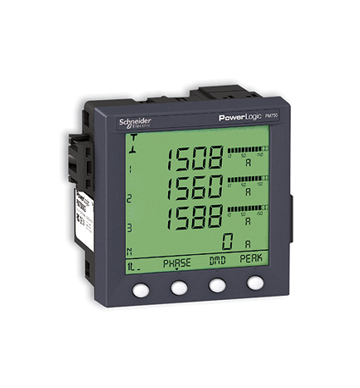 The PM700 series meter offers large, easy to read characters for viewing multiple values at one time to get a snapshot of your circuit. This series features a 96x96mm design with a mounting depth of only two inches makes the power meter ideal for low voltage switchboards, shallow cable compartments, standalone machines, and a wide range of commercial and industrial applications. Finally, the meter can be mounted with clips, eliminating the need for additional tools. Complete with power, demand, energy, power factor, and frequency measurements, PM700 series meters are available in a variety of flexible configurations and have IEC62053-21 Class-1 and IEC62053-22 Class 0.5S (PM750 only) certification for basic sub-billing or cost allocation. The Series 700 meters with I/O capability are ideal for commercial building load control applications as well as monitoring pulses from other utility meters (ex. Water, Air, Gas, Steam).